In 2000, experimental vocalist and composer DB Boyko was living in Vancouver when she was asked to become the musical director of the Songbird project, a campaign about the ecological impact urban centres have on the life of songbirds. While working on what would become the Songbird Oratorio, the director suggested she partner up with fellow experimental vocalist Christine Duncan, whose nearly five-octave vocal range could help in recreating the high-pitched modulations of a songbird. "It was very apparent right at that time that we had a really interesting chemistry," Boyko says looking back on their first meeting. "At the time we would sing together and not even be sure who was singing. That's how connected we were able to get." The spark was lit between the singers and they became frequent collaborators, working on multiple projects and hosting improvisational choir workshops around Canada. Recently something changed with Boyko---she simply couldn't get her head out of the toilet. 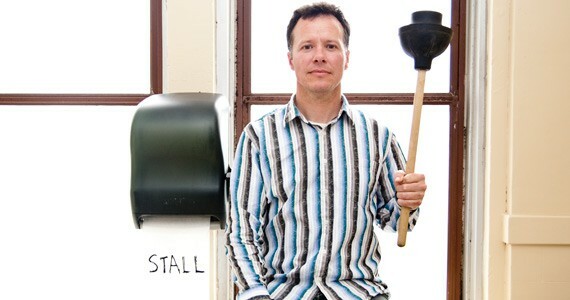 Composed by Victoria's Christopher Butterfield and commissioned by Boyko and Duncan, Stall examines the inner workings of washrooms in a public restroom performance. They began by collecting stories about odd experiences in public restrooms, hijacking phrases from graffiti on the walls and examining the plumbing systems of old metropolises like London and Paris. The performance, which focuses primarily on the culture surrounding women's restrooms, posed some issues for Butterfield. "He was like, 'Well, how the hell am I going to research this?' and Christine said, 'Well, honey, now's the chance to put on your bling and go reconnaissance'," Boyko says, laughing. After, Butterfield juxtaposed all the samples to create the sound collage, creating lists of phrases and sounds on paper, cutting them apart and rearranging them to make rhythmic combinations. In practices the pair had to use video chat to bridge the gap between Vancouver and Toronto. "We didn't have a lot of time to rehearse the piece so we had to practice on Skype. I should have known better---because I used to create a lot of internet performances---but I thought the delay had improved," Boyko says. "There are a few complex rhythmic passages and we're just slamming the whole time. It will be better when we're in person." Boyko says for the most part the performance is written, but there's room to improvise by experimenting with each washroom's natural reverberation.